Your donations from purchased items help support the Church and its educational programs. Thank you! Inner Oracle Self-Discovery Cards were designed to stimulate ideas for expanding self-awareness. These cards are tools for strengthening and enhancing your intuitive side, spiritual growth and enlightenment, and to stimulate ideas for finding solutions in life, business, relationships, and more. They are excellent for spiritual counselors and life coaches as an additional tool for helping clients. 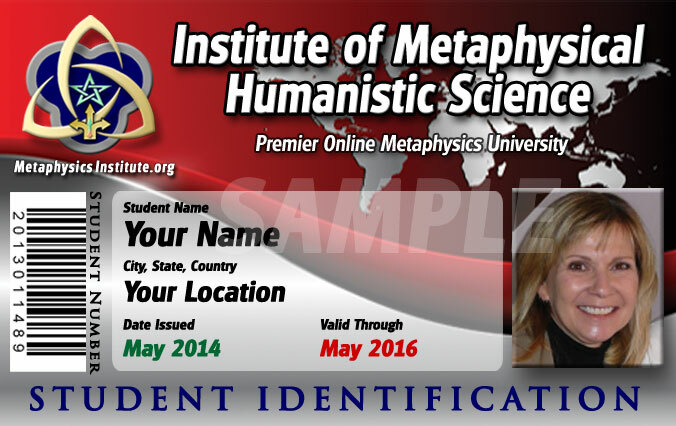 These tools are based on Dr. Kelley’s Life Leadership ParagonTM, The Enchiridion of Metaphysical Humanism, the Nine Principles of Belief of the International Church of Metaphysical Humanism, Inc., and other meta-physical topics taught at the Institute of Metaphysical Humanistic Science (IMHS). The deck consists of a total of 54 cards (3.5" x 5") in five suits, plus nine Wild Cards. Each card has a different Action Statement (face value). An instructional Guidebook with card descriptions and five spread diagrams are included. Shipping: U.S. Priority Mail: $6.50. Int'l: USPS Priority Int'l $32. Please allow 5 - 10 business days for delivery. Int'l orders can take up to one month for delivery (depending on the country). Several items can be combined in one shipping charge. Size: 3.5" W x 5" H.
Diplomas and Ordination Credentials are printed on quality 8.5 x 11 gold parchment with gold seal. Practitioner's Certificates are printed on parchment cardstock with gold seal. PLEASE NOTE: A digital version is always included with every degree or certification. This is for printed replacement only. Contact admin@icmhchurch.org if you need a digital copy only. Shipping: U.S. Priority Mail: $6.50. Int'l: USPS Priority Int'l $32. Please allow 5 - 10 business days for delivery. Int'l orders can take up to one month for delivery. Several items can be combined in one shipping charge. You must have earned an IMHS / TFU Bachelor's, Master's, or Doctoral degree in order to purchase a printed diploma. Please include your full name and the certificate code for the diploma you are requesting. You can find the certificate code on your transcript or original diploma. IMHS STUDENT ID CARD You must be enrolled in the IMHS Degree Program in order to purchase this item. Student ID's can be used for discounts in various places including theaters and even local classes and courses. This credit card sized Student ID comes in PDF format for you to print and laminate. You must also email a headshot photo of yourself to admin@metaphysicsinstitute.org. Your photo should be at least 200 pixels in height in jpg or png format. Please allow a day or two for delivery back to you via email. You must be enrolled in the IMHS Degree Program in order to purchase this item. CPI / CLPI ID BADGE AND CERTIFICATE You must have completed the CPI or CLPI course to purchase this item. These items are for new and replacement credentials. 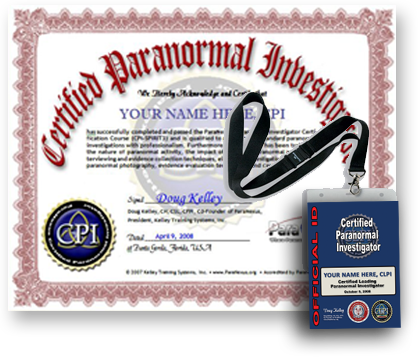 Included is both a printed CPI or CLPI certificate and laminated ID Badge with lanyard. You must email a headshot photo of yourself to admin@icmhchurch.org. Your photo should be at least 200 pixels in height in jpg or png format. Please keep your photo a well-presented headshot with no one else in it. Shipping: U.S. Priority Mail: $6.50. Int'l: USPS Priority Int'l $32. Please allow 5 - 10 business days for delivery. Int'l orders can take up to one month for delivery. You must have completed the CPI or CLPI course at IMHS, Thomas Francis University, ICHS, or ParaNexus Academy to purchase this item. ICMH Officiation Stole This product is only available to ICMH Ordained Ministers. 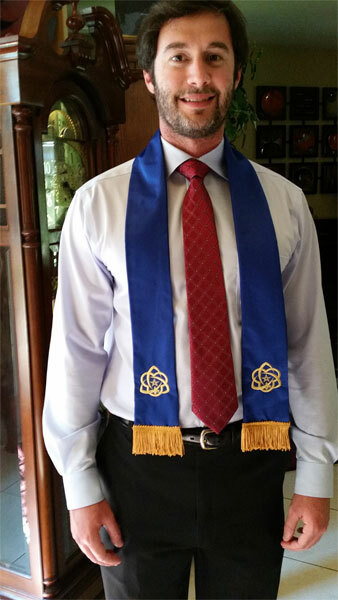 This custom-made stole is beautifully adorned with the Church's logo embroidered in gold thread on either side. It is elegant and perfect for officiating at ministerial functions including church services, weddings, and funerals. This stole is made from satin-finish material and is available in white or purple. Total length is 102 inches (51 inches per side). The upper portion is cut out so that it lays flat against the neck. 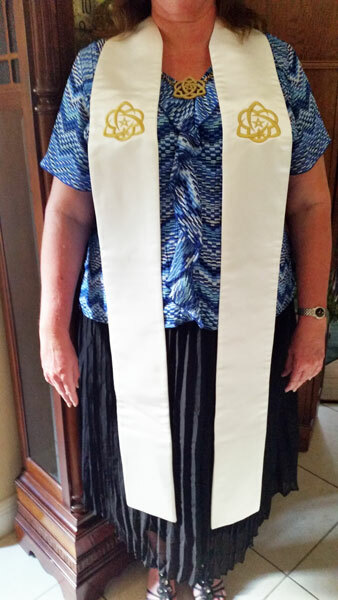 This stole is designed to be worn with the Church's Logo Medallion below to create the ICMH Officiation regalia. Care instructions are included. This product is only available to ICMH Ordained Ministers. ICMH Visitation Stole This product is only available to ICMH Ordained Ministers. 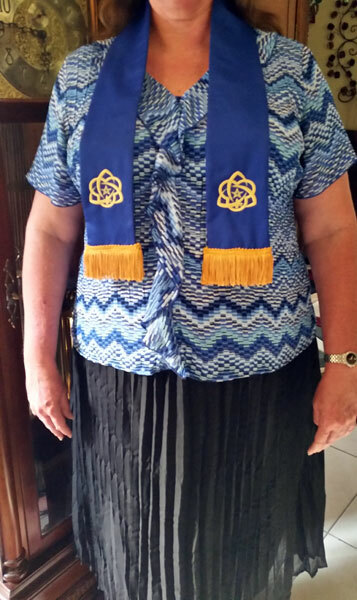 This custom-made stole is beautifully adorned with the Church's logo embroidered in gold thread and features gold fringe on the bottoms of each side. It is elegant and perfect for ministerial visitations such as in hospitals and ministerial in-home visits. This stole is made from satin-finish material and is available in blue. Care instructions are included. ICMH Logo Officiation Medallion This product is only available to ICMH Ordained Ministers. This custom-made ICMH logo medallion is available in several colors and materials. 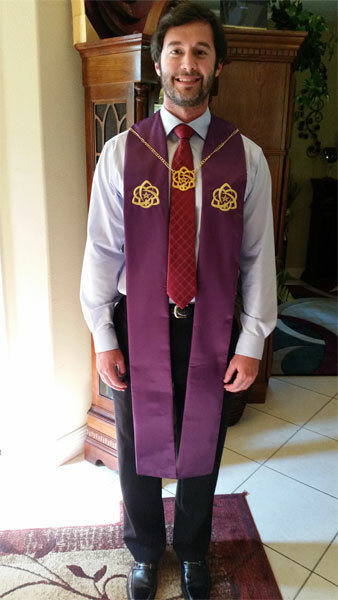 It is designed to compliment the Church's Officiation stole above. It comes with a chain. 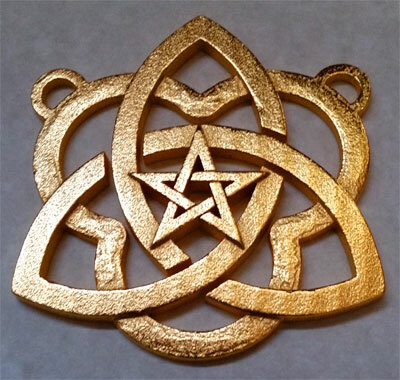 Each medallion is made-to-order, so please allow 4 to 6 weeks for delivery. If you order this medallion with a stole, we will ship your order when your medallion is ready. Shipping: U.S. Priority Mail: $6.50. Int'l: USPS Priority Int'l $32. Please allow 5 - 10 business days for delivery. Int'l orders can take up to one month for delivery. Several items can be combined in one shipping charge. This custom-made ICMH logo pendant is available in polished steel in several colors. Each pendant is made-to-order, so please allow 4 to 6 weeks for delivery. If you order this pendant with other items, we will ship your order when your pendant is ready. Shipping: U.S. Priority Mail: $6.50. Int'l: USPS Priority Int'l $32. Please allow 5 - 10 business days for delivery. Int'l orders can take up to one month for delivery. Several items can be combined in one shipping charge. Size: 1.375" H x 1.25" W.